Worthen Industries sustainability team members Shaye Hardner, left, and Doria Brown stand among the factory's rooftop solar panels in Nashua. Factories in New Hampshire pay more for energy than they would in almost any other state. There are steps they can take to reduce their costs – but those changes can be expensive, and they could even require policy reform. Still, some businesses are making investments and getting creative to try and save on energy. Industry leaders have a big conference in Manchester every year just to talk about this issue. At last month's meeting, a vice president from the gun-maker Sturm, Ruger talked about his company's challenges. Tom Sullivan says they're streamlining in lots of ways, but: “The one thing we don’t have a lot of control over is our energy costs," he says. Energy costs for Ruger are around $4 million a year. They use about as much electricity at their New Hampshire factory as it takes to power a thousand homes. “Energy starts to become really a driving factor in terms of where we're going to locate factories over time," Sullivan says. And in New Hampshire, energy is expensive. Federal data for October 2018, the most recent available, put the Granite State’s electric rates for industrial customers at nearly 90 percent higher than the national average. So for facilities that need lots of power to run huge machines for hours a day, there are basically two options: use less power, or make your own on-site – say, with solar panels or biomass. But making those kinds of changes takes investment, and Sullivan says it doesn't pencil out for Ruger. The company is publicly traded and answerable to shareholders. Sullivan says it would do more to lower rates if the region builds more energy infrastructure and rolls back regulations. But some companies are taking a different approach. Nashua-based Worthen Industries makes special coatings for fabrics and paper. They're privately held, which gives them more flexibility on how they invest in energy improvements. 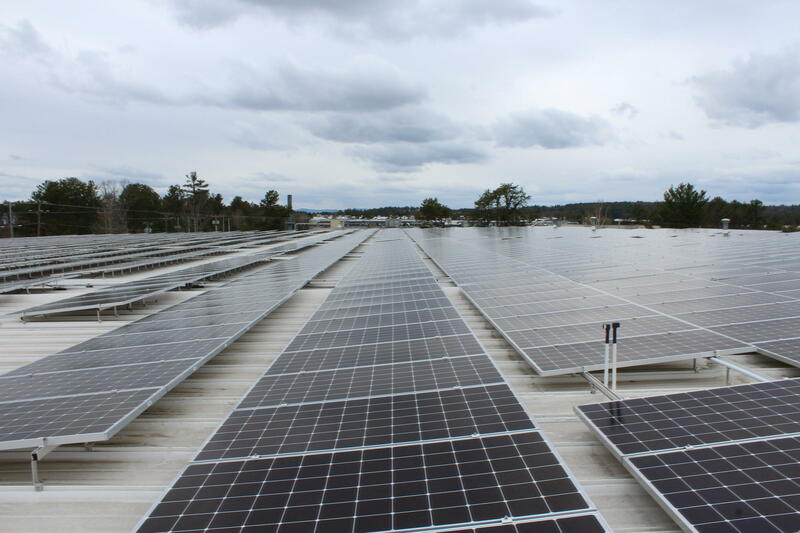 Worthen can get up to 45 percent of its Nashua plant's power needs from this rooftop solar array. Up on the roof of their factory, more than 2,700 solar panels feed energy to the machines humming below. Even on an overcast day, sustainability coordinator Doria Brown says the panels are "still working – they're cranking more than you might think." This is one of the largest rooftop solar arrays in the state. Brown says it can provide up to 45 percent of Worthen's power needs. And whatever they don't use, they can sell back to the regional grid: "We get a credit for the electricity that we send out at a wholesale rate," she says. That's called net metering, and Brown says it adds value to the investment Worthen made in these solar panels by shaving a little more off their monthly bills. They'd like to install more panels, but they're nearly at the limit for what they can sell back to the grid. Governor Chris Sununu vetoed a bill to increase that limit last year. Democratic legislators say they'll bring the proposal back this year, as part of a big push to support renewable energy. In the meantime, Worthen is investing in energy efficiency – outfitting their lights with timers and motion sensors, and tracking the power use of certain big machines. Worthen sustainability director Dennis Sasseville says they'd welcome any new legislation that gives them more flexibility to do these projects – saving money and offsetting their environmental impacts. "Not everyone sees things our way, in terms of that clean tech, clean energy is the way to go," he says. "We just think that’s the future … and we think that New Hampshire should be on the forefront of that, not sort of lagging behind." Across the state in Hanover is another company looking to reduce energy costs – by reducing its footprint. Hypertherm is employee-owned, and makes metal cutting machines. But they've decided making their own renewable energy isn't the way to go, says environmental stewardship manager Robin Tindall. 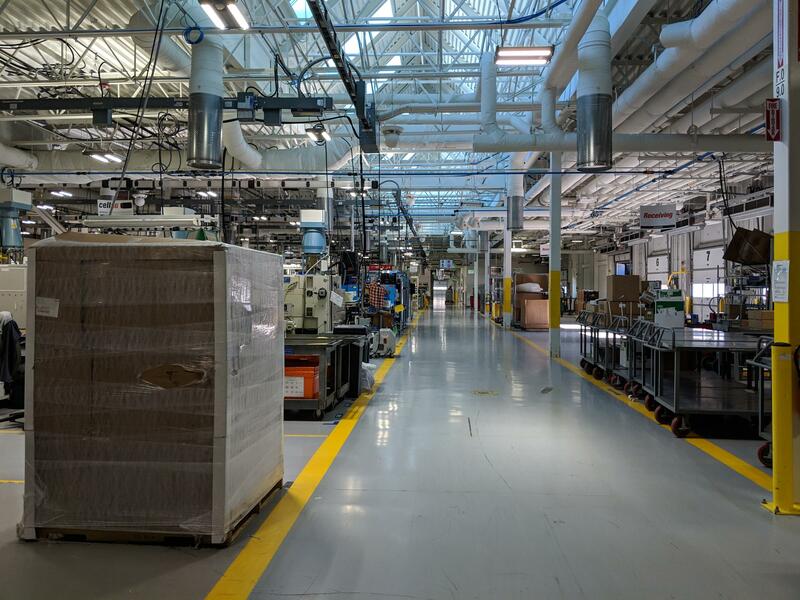 Hypertherm's Hanover factory is lit by skylights and motion- and timer-controlled LED lights. "We’ve investigated renewables a few times, including rooftop solar at this building," she says. "But we’re such a big energy user that even filling our entire rooftop and some of our parking lots with solar panels would only give us, like, single digit percentage of what we need." Tindall says Hypertherm is focused on reducing their energy demand, instead – and they've invested in a lot in doing so. On a recent factory tour, Tindall showed a group of business leaders, legislators and lobbyists one example: a big robotic arm busily cutting away at hundreds of copper castings. "It’s called Becky. It's been here for a few years," Tindall said. "That down there is Han Solo. I have no idea how they got their names." The robots waste less material, and spare human workers from repetitive motions. Becky can also run at off-hours with the lights out. And it uses less energy than the machines it replaced. Hypertherm has reduced its energy use by 18 percent since 2010, saving $4 million, and they're continuing to work toward bigger goals. Tindall says they still rely on expensive power from the grid, but with some creative innovations – everything from processing mop water more efficiently, to installing skylights – they're trying to use as little as possible. It’s already been a cold winter, and we haven’t even hit January. Keeping the heat running and lights on night after night quickly adds up. Across the state, homeowners are getting creative about ways to keep costs in check and, in some cases, transition to renewable fuel at the same time. In the Upper Valley, one city is particularly out front on this challenge. State Gives Liberty Green Light For Home Battery Pilot Project In N.H.
New Hampshire regulators have given Liberty Utilities final approval to test a first-of-its-kind home battery storage project. Liberty will sell Tesla Powerwall batteries to 500 of its customers in Southeastern New Hampshire and the Upper Valley. Spokesman John Shore says the batteries will charge overnight, storing power when demand and rates are lowest. They can also be charged with solar power installed at the user's home. When Low Taxes Aren't Enough: How State-Backed Incentives Help Lure Businesses to N.H.
Corporate subsidies are something of a taboo topic in New Hampshire. The state historically doesn’t offer them and, to hear most elected officials explain it, they wouldn’t even consider subsidies when courting new businesses. That was the case when Amazon was scouting potential sites for its new headquarters and 50,000 accompanying jobs. The state's Business and Industry Association talked energy rates, infrastructure and policy Thursday at an annual symposium in Manchester, and the pros and cons of renewable development were a big topic.